BEIJING, Dec. 21 (Xinhua) -- The annual Central Economic Work Conference was held in Beijing from Wednesday to Friday, as Chinese leaders charted course for the economy in 2019, a key year for the country to achieve its goal of building a moderately prosperous society in all respects by 2020. 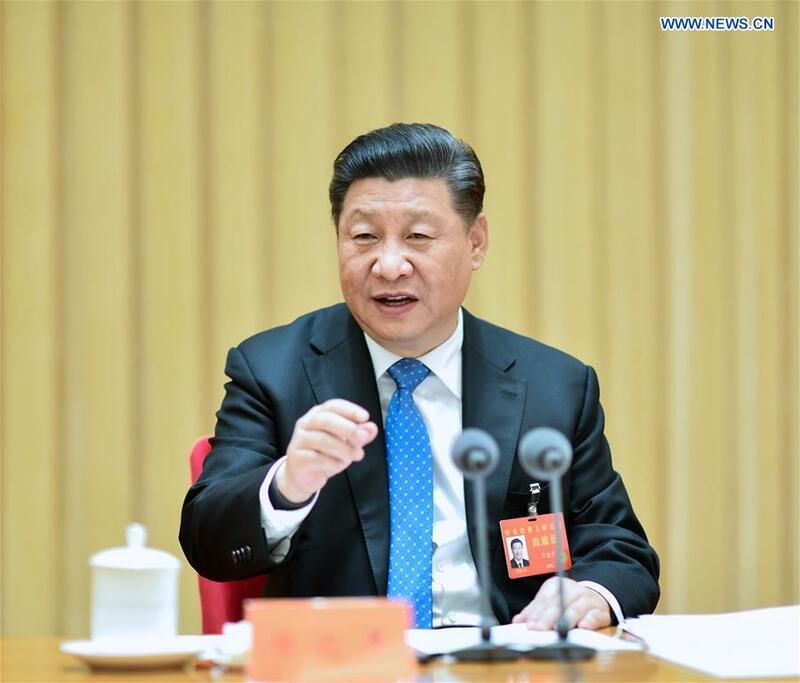 In a speech at the conference, Xi Jinping, general secretary of the Communist Party of China (CPC) Central Committee, Chinese president, and chairman of the Central Military Commission, reviewed the country's economic work in 2018, analyzed the current economic situation and arranged the economic work in 2019. The meeting was also attended by Li Keqiang, Li Zhanshu, Wang Yang, Wang Huning, Zhao Leji and Han Zheng, all members of the Standing Committee of the Political Bureau of the CPC Central Committee. China has effectively coped with profound changes in the external environment this year, risen to challenges with solid work, accomplished the goals of macro-regulation relatively well and delivered a good start in the three tough battles against major risks, poverty and pollution, according to a statement issued after the meeting. Meanwhile, the country has deepened the supply-side structural reform, pushed forward reform and opening-up with greater efforts, properly dealt with the Sino-U.S. economic and trade frictions, improved people's well-being, and maintained sustained and healthy economic development as well as overall social stability. The country has "made new steps towards finishing the building of a moderately prosperous society in all respects," the statement said. "The achievements we've made have not come easily," it said. Over the past year, the leadership has gained a deeper understanding about economic work under new circumstances, according to the statement. It said the country must uphold the centralized and unified leadership of the CPC Central Committee; assess current circumstances from a long-term perspective and have a clear vision about the country's long-term promising development prospects; make macro-regulation precisely, actively fine-tune policies and enhance policy coordination; timely respond to concerns of the society and guide market expectations in a targeted manner; give full play to the initiative of all parties to form synergy. "While fully acknowledging the achievements, we must see that there are new and worrisome developments amid generally steady economic operation, the external environment is complicated and severe, and the economy faces downward pressure," the statement said. However, it described the problems as part of development, noting that China is still and will be in an important period of strategic opportunity for development for a long time to come. The world is facing unprecedented changes in a century, bringing both challenges and opportunities, the statement said. To turn pressure into impetus for high-quality development, China should speed up the optimization and upgrading of its economic structure, enhance the capability of technological innovation, deepen reform and opening-up, accelerate green development, and participate in the reform of the global economic governance system. Ensuring sound economic work is especially important for 2019, which marks the 70th anniversary of the founding of the People's Republic of China and is key for building a moderately prosperous society in all respects, the statement said. China will strengthen counter-cyclical adjustments in its macro policy, continue to implement the proactive fiscal policy and the prudent monetary policy, make pre-emptive adjustments and fine-tune policies at the proper times, and ensure stable aggregate demand, according to the statement. Bolder and more effective measures must be taken to implement the proactive fiscal policy, with a larger scale of tax and fee cuts and a relatively substantial increase in the issuance of special-purpose local government bonds, the statement said. China will keep the prudent monetary policy "neither too tight nor too loose" while maintaining market liquidity at a reasonably ample level, according to the statement. The monetary policy transmission mechanisms will be further smoothed out while the proportion of direct financing will be increased to make financing more accessible and affordable for the private sector and small businesses. Reforms in various fields including state-owned enterprises (SOEs), taxation and financing, land, market access as well as social management will be pushed forward, while the institutional environment will be improved to encourage fair competition and facilitate the accelerated development of small and medium enterprises (SMEs). Social policies should be made to help those most in need, while high priority will be given to employment, the statement said. China must stick with the supply-side structural reform to tackle major economic problems and more frequently resort to market-oriented and law-based means, the statement said. Previous structural adjustments should be reinforced, with continued efforts to downsize glutted industries, reduce all types of business burdens and channel more energy into weak areas including infrastructure. Micro market entities will be further motivated and energized, with the establishment of fair, open and transparent market rules and a law-based business environment. China will work to promote technological innovation and foster new industrial clusters, build a unified and open market system with orderly competition, and prompt the financial sector to better serve the real economy. The meeting said the country has won "the initial victory in its three tough battles" against risk, poverty and pollution this year, and targeted efforts will be taken in 2019. China will adhere to structural deleveraging, prevent abnormal financial volatility and properly handle local government debt risks. Areas in abject poverty and special groups will receive more government support. While greater efforts and input shall be made in pollution control, government departments must take into consideration all factors and help businesses find solutions. Policymakers mapped out major economic tasks for the next year at the meeting. High-quality manufacturing development will be put high on the work agenda, according to the statement, which stressed unwavering efforts to build the country into a manufacturer of quality and the integration of advanced manufacturing and modern service sector. While swiftly resolving zombie enterprises, China will foster new technologies, new organizational forms and new industrial clusters. Manufacturing technological innovation capacity will be strengthened with the establishment of an open, coordinated and effective platform for the research and development of generic technology. SMEs will see greater support in innovation, and the protection and utilization of intellectual property rights will be enhanced. With one of the world's largest markets, China should continue releasing its potential to expand its domestic market, the statement said. While accelerating the development of the service industry, including education, childcare, elderly care, medicare, culture and tourism, China needs to improve its consumption environment and boost consumer spending. With its tremendous potential in investment demand, the country must reinforce investment's pivotal role, facilitate the upgrading of manufacturing technologies and devices, and accelerate the commercial use of 5G networks, and create infrastructure for artificial intelligence, industrial internet, and the internet of things. The country should also encourage investment in intercity transport, logistics and municipal infrastructure, strengthen rural infrastructure construction and public service facilities, and improve natural-disaster preparedness. On rural vitalization, China must prioritize developing agriculture and the rural economy, improve agricultural structure and increase supply of high-quality and green agricultural products, according to the statement. China needs to attach greater significance to new business entities such as family farms and farmer cooperatives to alleviate difficulties in household farming. The country should also promote waste recycling, carry out the toilet revolution and continue deepening rural land system reform. The meeting called for faster SOE reform. It also stressed efforts to strengthen state-owned capital, restructure state-owned capital investment companies, and advance mixed-ownership reform. The shareholding reform of China Railway Corporation should be accelerated, the statement noted. The meeting also urged support for private companies by nurturing the legal environment and protecting private entrepreneurs' personal and property safety. Financial reform must be deepened with the restructuring of financial system as the focus. Financial infrastructure needs improvement and enhanced supervision and service capabilities. Capital markets should be developed with more standardized rules, transparency, openness, vitality and resilience. The meeting called for accelerating launch of a science and technology innovation board on the Shanghai Stock Exchange and experimentation of registration system. Efforts should also be made to advance all-round opening up. Market access should be eased. Pre-establishment national treatment and negative list management should be implemented to protect the interests of foreign companies in China, especially intellectual property rights. The meeting called for greater efforts to increase imports and exports, push for a more diversified export market, and cut institutional costs of importing procedures. "It is necessary to build a community with a shared future for mankind, and also necessary for China to proactively participate in the reform of the World Trade Organization, and promote the liberalization and facilitation of trade and investment," it said. "It is necessary to implement the consensus reached by the heads of state of China and the United States in Argentina to advance bilateral economic and trade negotiations." The meeting called for efforts to improve people's well-being. Stabilizing employment should be put in a prominent place and more channels should be opened to assist college graduates, migrant rural workers and veterans in finding jobs. More investment should be channeled into preschool education, early childhood education in poor rural areas, and vocational education. More efforts should also be made to ensure safety of food and medicine, the workplace and traffic. The meeting called for a long-term mechanism to maintain the sound development of the real estate market and adhering to the principle that "housing is for living in, not speculation."